LegEasy 6 Windows is the first version in our LegEasy program. It was created by popular demand, and to rectify a serious problem for a lot of our users - incompatiblility of DataEase 6.x in Windows 7. When DataEase development was taken over by 4ThePeople, we quickly realised that the map didn't fit the terrain. The "common" belief in the DataEase camp, that the solution to all problems was simply to move to the latest version, didn't really ring true. We quicly realised that a lot of our users had stayed behind in older versions of DataEase. Our goal is to make DataEase as good today, as it used to be back in the good old days of DataEase for DOS. We realise that this is not done overnight, so we aim to make sure that everyone that use DataEase today, should be able to continue to use their applications as they are, when at the same time giving them a path forward. The goal of the LegEasy program is to offer Legacy users the safety net they have been missing, and give them the comfort of time and opportunity to move forward. One of the things that has been stressing our legacy users the most, has been the constant redefinition of functionality, and the fact that a upgrade was always a migrate. The fact that Migrate in DataEase terms, meant project didn't helpt the situation. We got the distinct impression that a lot of our users was "battle worn", so we decided that the main goal of our LegEasy program, was to insure that we din't change or break anything. People that use DataEase 6.x seem are in general very happy with it with one big exception, and that is that it looks very dated. The same way that it after a while become a little embarassing to have the little back dos box as your user environment, the Windows 3.11 appearance in 6.52 glowed of "outdatedness", so we decided that since we coulnd't play with the functionality in LegEasy 6, we could definitely play with the look and feel. No Trial but a full 30 record Demo version. For LegEasy 6 Windows we don't yet have a full trial as have become the norm for DataEase products with 7.2 and after. The normal DataEase Trial version is a Time limited full copy of the software. For LegEasy 6 Windows we have the old style Demo version instead. This is a fully functional version of the software without the time restraint, but with a overall 30 record limit pr. table. This means that you can only store 30 records in any given table. You will find the latest Demo version for free download - after signing up - at the download tab above or in our Download Centre. One of the key strengths of DataEase has always been its ease of use ? anyone who needs to store, retrieve or manipulate data can create an efficient and powerful database. Simply drag and drop objects to design your application. Use style sheets to apply customised fonts and colours. At any time, click on a button to switch between user and designer views to test your work. Easily create rules that validate and process your input information as it is typed. Cut down introducing bad data in your application. DataEase lets you easily define relationships that link the data tables in an application. These can be created ?on the fly? and you can display nested tables ? ?subforms? ? within your main form, making the display of related information easily accessible to users. Users can search through the data and produce their own reports without any programming knowledge. DataEase gives you several different levels of searching and reporting: Query by Form at form/data-entry level, for form searches, Query by Model, allowing you to write sophisticated multi-table reports with a few mouse clicks, and DataEase Query Language (DQL), an easy to learn English-like query language that allows complex reports and data processing procedures to be created using a simple set oriented method. No knowledge of SQL or programming languages is required. Your application can be reliably networked with many users, with real automatic network locking. Global options can be set to control the extent of locking. Refresh data on screen, instantly, automatically. Use one of the available 250 plus Custom Defined Functions (CDF?s) written especially for DataEase, or integrate general purpose Dynamic Link Libraries (DLL?s) to extend DataEase?s functionality even further. Or create your own! You can manipulate both the display of objects on your form and your data by attaching powerful scripts to buttons, fields or any other screen objects. Create audit trails of data input or change the colour and placement of fields conditionally by attaching a script to objects. Whilst it is acknowledged that DataEase gives you one of the quickest and most efficient development environments available today, a major component of the overall life cycle of an application is that of making changes to fulfil users? ongoing requirements. OML ? Attach scripts to the objects that appear on your DataEase form. All visual elements you use on Forms or other documents consist of Objects accessible from other documents in your application. As a developer you can give users as much or as little power as required by allowing access to your entire application or parts of it, ad-hoc reporting, and general maintenance functions. You can use views and filters to create alternative views on a form to present selected information in different ways. DataEase is a low cost, highly productive database with thousands of DataEase users worldwide. Full international support is available to our users. DataEase 6.53 will always be installed as Single User. If you want to run it as Multi User, you will need to manually set up the Multi User settings. Each workstation must have a full copy of DataEase installed. The AUTOEXEC.BAT file on each workstation must contain the DENAME environment variable described on the next page. LegEasy 6 only comes in full version at this stage. DataEase is undergoing major changes, but productwise and licenseingwise. We lauched LegEasy 6 as a rescue version for DataEase 6.x users, with the expressed intention to incentivice them to move forward when they "have caught their breath". This is why we offer it for FREE* if you later upgrade to DataEase 8. *FREE in this context, means that we will credit you, your entire LegEasy 6 outlay if you buy DataEase 8 within 12 months from buing LegEasy 6. Can I buy LegEasy 6 Windows? Over the last couple of weeks we have got some reports with this error message from LegEasy 6 Windows (6.53). The communality between the instances is that it was all on freshly installed Windows computers, but the windows versions ranges from Windows 7 Professional to Windows Server 2012 with Windows 8, 8.1 etc. in between. As none of our computers, partners computers or even friends computers have this problem it hasn't been easy to pin down. But this is what we know so far: It is has to do with a security update Microsoft has been distributing over the last couple of weeks and the problem is related to Domain/Active Directory. LegEasy 6 Windows in Spanish, the first step towards localised versions. We are proud to announce that LegEasy 6 Windows in Spanish is released today. It is a small and silent release, but one that will be the start of a new version for language versions in DataEase. Up to and including the first Windows version DataEase was to be found in a number of languages ranging from French, Dutch, German, Norwegian to Farsi and even one in simplified Chinese. When DFW struggled in the market the product got narrower and narrower until it ended up being published only in English. LegEasy 6 Windows - Spoilt for choice? Our way or no way! That is how it used to be around here. We took our time in updating and changing the product, and when it was published, that was more or less it. If you liked it - fine, if you didn't - What are you going to do about it? Our primary goal is to make money, and to make money we need happy customers. You pay us, and we deliver what you want. Sometimes we need to behave like parents, and give you what we believe you need, rather than what you ask for and hope that we got it right, and that you will realise that we were right when you got to see and test it. For a long time DataEase did very little listening, and when we did we listened to the wrong people. As it turns out, it is not always the ones that cry the loudest that are right. When we made LegEasy 6 Windows, is was because we realised that we hadn't listened, and that people really struggled with migrating/upgrading from 6.x to 7.x. We realised that it is not good enough to simply say "upgrade or die" or "My way or the high way! ", we needed to start looking after our customers and offer them a proper route forward. Our users have asked us why they should upgrade to LegEasy 6 Windows? Is it simply because it will run under WIndows 7, or is there any other reason? It is supported, and we are committed. We know that a lot of DataEase 6.x users, have tried migrating to DataEase 7.x, and for variable reasons this has not been a success. In the early days (7.0 and 7.1) the problem was that 7.x was still a immature product, and later when things stabilized in 7.2, the problems where related mostly to performance in forms with memo fields. A lot of you have soldiered on and worked around the problems, but a lot just simply stayed in 6.x and waited. This worked fine until Windows 7, where 6.x was challenged. Our "quick fix" for this is 6.53, and we are happy to say that it have made a lot of 6.x users very happy. False Virus Detection in 6.53: Resolved! Soon after the release of 6.53 we started to get reports from our customers that the software wouldn't install properly. After some investigation, we found out that it installed properly but some of the system files was identified as "possible" viruses by Norton/Symantec virus software, and quarantined. We immediately started to investigate, obviously fearing the worst, but we quickly discovered that it was a "False" virus detection based on Heuristic algorithms that try to predict "new" and unknown viruses. The immediate solution was to tell our users to "approve" 6.53 by the Virus software, the proper solution is available for download today. 6.53 has now been out for 3 months, and it has been very few reported problems. No software, old or new will or can be released without some problems being reported. The intentions behind 6.53 was to create a "modern" version of DataEase 6, but without changing, adding or subtracting any functionality. Since the version was created to fix a acute problem - DataEase 6 not working under Windows 7, we didn't want to add any new ones. The main problem reported in that 6.53 is considered to be suspect by some virus programs, especially Norton/Symantec - it is not, and the other is problems when in conjunction with Windows Server 2008. The problems reported on Windows server 2008 has been that 6.53 does not lock data at all, or that data get corrupted. 6.53 is a recompiled version of 6.52 that is prepared to run with Windows 7 x86 and x64. It has not been improved or bug fixed in any functional way to retain 100% comaptibillity with DataEase for Windows 6.52. On the other hand, we have made it look contemporary with a "livery" borrowed from the latest DataEase for windows and inspired by DataEase Generation 3. Multi User and Multi Session setup in Legacy versions of DataEease is and was never as simple as it should have been. We have to admit that it was very tempting to "sort" this out in 6.53, but in the end we kept to the scope and left it as it is. In 6.52 you have to re-install the software to change the Network Setting, but if you choose anything but "None" on locking model, 6.52 will not work until you have configured the network setting manually. The help files that accompany LegEasy 6 is the original 6.52 files in .HLP format. Windows Help (WinHlp32.exe) is a Help program that has been included with Microsoft Windows versions starting with the Microsoft Windows 3.1 operating system. However, the Windows Help program has not had a major update for many releases and no longer meets Microsoft's standards. Therefore, starting with the release of Windows Vista and continuing in Windows 7, the Windows Help program will not ship as a feature of Windows. If you want to view 32-bit .hlp files, you must download and install the program (WinHlp32.exe) from the Microsoft Download Center. Alternatively you can download the entire collection of DataEase 6 Documentation here as .PDF files. LegEasy 6 Windows (6.53) is the first step on the ladder towards the new DataEase. Our focus is not to allow you to maximise the value of your existing applications, when at the same time you will be able to move forward onto the web and out into the world with DataEase Generation 3. 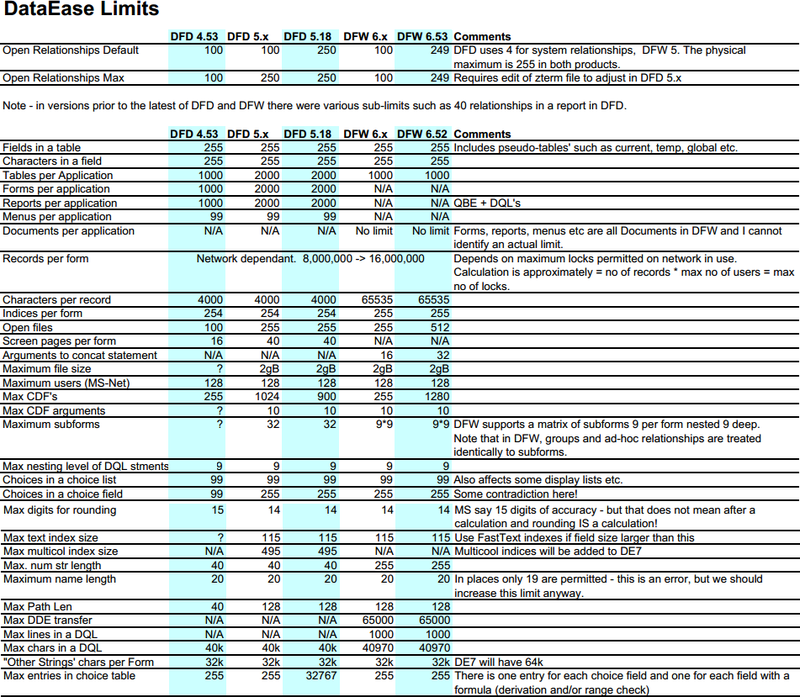 6.53 is the first DataEase version that is released by 4ThePeople Ltd, but we have many more in the pipeline. It will soon be followed by 7.5. DataEase Generation 3 is already in Pre-Release, and is used every day to build Web front ends on existing 5.x, 6.x and 7.x applications. 6.53 is not a "new" version, but when you download and install it, it will feel brand new. We have given it an extensive work over, with completely new look and it is also fully Windows 7 compatible. You get your own way. If you have not migrated to DataEase 7 yet then you no longer need to.